As this article is being written, two of the largest constituent states of the old Union of Soviet Socialist Republics, Ukraine, and Russia, are getting ready to go to war. 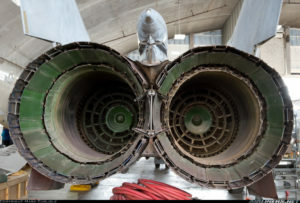 But as these two former relatives stare down on each other, one lightning-fast weapon most certainly won’t be used – the fearsome MiG-25 „Foxbat.“ An incredible plane we at MiGFlug once offered flights in – see here. After protestors overthrew the pro-Russian government of Ukrainian president Viktor Yanukovych, Russia has turned away to protect what it considers its own interests. Namely, something lately buzzing around several news articles, the Crimean peninsula, and furthermore, the rest of Ukraine. Things are not looking good, to use a bit of understatement. But while the pro-Russian invasion of Ukraine might be done using vast fleets of attack helicopters and broken-down armored personnel carriers, the old laser-quick holdover from the Soviet Union that served in many of its descendant Air Forces, the MiG-25, won’t be there. The Ukrainian Air Force retired its MiG-25 a long time ago, but the Russian Air Force just decommissioned their last examples, the reconnaissance MiG-25R model, in December. 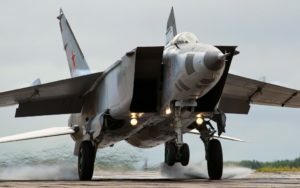 There are scattered reports of MiG-25s still being used in the services of Azerbaijan, Algeria, Armenia, and Syria, but as those countries can barely afford the fuel to get the fuel monster off the ground, it might as well be good as dead. But what a crazy rat rod it was. For those who are unfamiliar with the term, a „rat rod“ often looks so old, it looks beat up, it looks like it was designed specifically to not be pretty. It just looks deadly. And yet to be a true rat rod, it’s got to have a ridiculously powerful engine under the hood. Because you just got to go fast. Rat Rods are cool. Which is why we all love the MiG-25. It’s not pretty, at all, and every example looked unkempt, full of grime and rivet heads looking like they still need to be fastened. But it had a huge monster of an engine. Make that two of them. Work on the MiG-25 began in the early 60s in the Soviet Union’s Mikoyan-Gurevich design bureau. Faced with the daunting prospect of American B-70 Valkyrie bombers screeching like a cat over the horizon at thousands of miles an hour, the Soviets were in need of a plane that could intercept them and stop them before they unleashed their dirty nuclear payloads. And because the prototype for the bomber, the XB-70, could travel at three times the speed of sound, the new interceptor needed to utilize speed above all else. Something never seen before. Fighter planes designed nowadays blend a mix of maneuverability, stealth, and advanced avionics to make a state of the art balanced weapon. The MiG-25 was not that. To say the plane was shaped like a bullet is to do it a disservice. It’s shaped like a hypersonic space needle. Just imagine grabbing the biggest engine you could find, and building a plane around it. Now double that, make that plane have two of those engines. That’s basically what we’re talking about. And because the Soviet Union was caught with constant material shortages and the plane itself presented unique challenges, the result was absolutely great. Mikoyan-Gurevich (MiG), the plane’s designer and builder, originally wanted to make most of it out of titanium. That was a good idea, as titanium is light, strong, extremely heat-resistant, and the Soviet Union was the world’s main source of the metal in the 1960s, when the plane first flew. The only problem was that titanium was still very expensive, and difficult to work with. Which is a bad problem in a place that doesn’t have the greatest manufacturing standards. So titanium was only used where absolutely necessary, and the rest of the aircraft was made mostly out of a nickel-steel alloy. It was mostly welded together, but if an exposed rivet-head wouldn’t adversely cause an effect on the top speed, it was left as-is. The radar didn’t use any of those fancy semiconductors being used in contemporary aircraft, either, sticking to good old fashioned, ridiculously overpowered vacuum tubes. Vacuum tubes are more likely to survive the pulse from a nuclear explosion. Oh, and they had a really weird unintended side effect, at least if only anecdotally. Rumors tell of the radar throwing off so much energy it would kill rabbits making their way near the runway. And that’s just the bits that didn’t help it go fast. The whole monster was powered by two gigantic Tumansky R-15 turbojets, with equally massive intakes up front, for better feeding the engines the ridiculous amounts of oxygen they craved. One small problem with going over Mach 3, though. If the Tumansky was an animal, it would be a voracious mutant. Push it above three times the speed of sound, and it became an unstoppable, rabid force of nature, continuing to eat fuel and spit out fire until it eventually tore itself apart. Theoretically, the MiG-25 could top Mach 3.2, but the throttles were redlined at Mach 2.8 in what seems like a desperate act of self-preservation by the plane. Above speeds of 2,000 miles per hour, the Tumansky engines began to transform. The sheer power of air rushing into the intakes at such speeds totally overwhelmed the fuel pumps. No longer capable of limiting their own flow, fuel would just be dumped into the combustion chamber at a totally uncontrollable rate. Air would begin to speed past the turbine compressors, turning the engines into ramjets. A pilot would almost certainly be killed, sitting at the front of what had effectively become a runaway train, miles above the rest of humanity. All that is theoretical, of course. In reality, the plane began to eat away at itself before it came close to its own top speed. Before the air could bypass the compressors, the compressors themselves would become so powerful that they would literally start to cannibalize other pieces of metal, sucking in bits and pieces until everything would just disintegrate. Because the original foe of the MiG, the Valkyrie, never made it into production, the MiG-25 never truly found its niche and was not as useful as it was thought to be. Owing to its great weight and relatively high wing loading, it couldn’t do turns very well, so it wasn’t much of a dogfighter. How fast was it tracked? 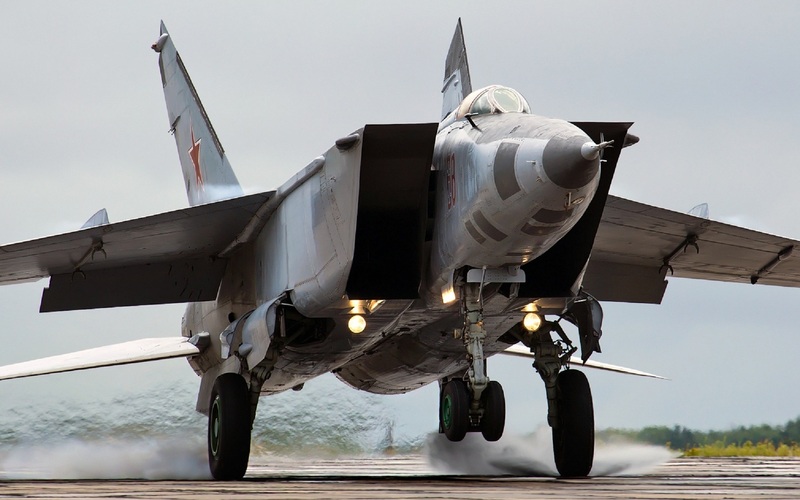 The MiG-25 was once tracked by Western radars near its top speed, but only once. In March of 1971, an Egyptian Foxbat was recorded by the Israelis going Mach 3.2 over the Sinai desert. The pilot managed to land the plane, but the engines were totally done and destroyed. Some more fast planes? Here is the Top 10! What’s up with the puerile Russophobic rambling at the beginning? Those paragraphs utterly ruined what could have been an insightful and thought-provoking essay, turning it into nothing more than a piece of anti-Russia propaganda. Why even start with the Ukrainian conflict? Why not start with the defection of Viktor Belenko? Agreed. The whole Ukraine problem stinks of CIA „regime change“. The CIA plan seems to surround Russian with hostile neighbors. As far as I am concerned, neither the Russian people nor Putin are our problem. Their fake „religion“ commands them to kill everyone else, take what they could never build, and degenerate back to mud huts, sodomizing boys, mutilating girls, and abusing women and whoever is physically vulnerable. The only „peaceful“ Moslem is a man who isn’t really a Moslem, just like most people who claim to be Christian don’t have a clue what the word means and never open a Bible. Pound-feet or foot-pounds is a measure of torque, not of straight-line thrust. Lets leave politics dirty or otherwise out of this beautiful plane article please? Algeria still operates four Mig-25 as recce aircraft for the Navy. In 1983, one Algerian Air Force Mig-25 took-off from Oran AB flew over both Morocco and Spain at a tremendous speed. The aircraft reached the Atlantic Ocean within minutes before returning base at Mach 3.1.